I thought today would be the perfect day to review this unicorn of a book. It is All Saints' Day—a fitting day to revisit all the crooked ones, no? It is also the first day of November and so, today, . . . well, you know the rest. What I'm saying is, today is kind of the perfect day to do all the Maggie Stiefvater-related things! Which is, of course, why I'll be attending her signing event later this evening at my local indie, key in hand. I know. I win today. I do. What I do not do is take it for granted. My good fortune or this book. This beautiful, beautiful book. But before we get into my reaction, I want to make a brief request. If you haven't yet had a chance to read Maggie's post on how this book came about and what it was originally going to be and what it actually became, I straight up implore you to do so. It is one of my favorite things I've read this year and it is something I needed to read this year. My favorite line? "I discovered that I wanted to instead write about light." The time the 1962. The setting is the tiny hamlet of Bicho Raro, Colorado. The problem is Beatriz, David, and Joaquin Soria have a rather desperate secret. The three cousins run an illegal radio station out of the back of a 1958 Dodge moving truck. Joaquin is the voice. Beatriz is the heart (and brain). Daniel is the Saint. Among the tight-knit, if wildly unusual Soria clan, there is always a Saint—one of the family members given the magical task of granting miracles to wandering pilgrims. People from all over find their way to Bicho Raro in search of miracles. Some of them leave. But some of them stay, waiting desperately for that last most difficult step in the process—that acceptance of their miracle, of the darkness within them, of what they must do to accept their miracle, solve their darkness, and move on (both literally and figuratively) from the little town, its mysterious inhabitants, and the multitude of owls inexorably drawn to the miracles. But it is not just the pilgrims who are required to accept what they cannot. It is also the Sorias. For Daniel has done what no other Saint has. He has interfered with one of his own miracles by trying to help one of the pilgrims who has come to mean something more to him than she should. Now his own darkness is coming to swallow him whole, and possibly every inhabitant of Bicho Raro along with him. I know that Maggie can turn her hand to anything she likes and have it come off beautifully, but the fact that she chose to turn to magical realism and light at this specific point in time is a bit of a godsend as far as I am concerned. Because we collectively needed this book, I think. It is gentle and sweet in the way that only true gentleness and sweetness at the heart of ever-encroaching darkness can be. This book felt like a prayer, in the most far-reaching sense of the word—its cadences soft and ongoing, its longing true and framed by real need, its love rooted in the beauty of this flawed world we live in and in the people whose hearts and breaths imbue it with meaning. The entire time I was reading, I felt I was living inside one of Ronan Lynch's dreams. This book is a fable and a love letter, a reminder and a jumping off point. 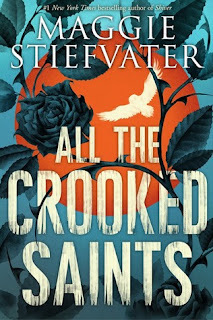 I fell in love with each of the crooked saints and their pilgrims, with Marisita and her rain-soaked butterfly dress, with Francisco and his whistling language and way with misused fowl, with Tony and his unavoidable heights, and, yes, most of all with Beatriz and Pete. Pete who wasn't there about a miracle at all, but rather about a box truck he believes might help fill the hole in his heart. And Beatriz who simply wants to understand and know more, and who fears being asked to do anything else. Watching Beatriz and Pete was a privilege. It was nothing extravagant, just Patsy Cline sung in his low and uneven voice, and they began to dance. It was very quiet. No one else would have seen if not for the desert. But when the desert heard Pete Wyatt singing a love song, it took notice. The desert loved him, after all, and wanted him happy. So when it heard Pete singing, it rose a wind around them until the breeze sang gently like strings, and when it heard Pete singing, it provoked the air to heat and cool around every stone and plant so that each of these things sounded in harmony with his voice, and when it heard Pete singing, it roused Colorado's grasshoppers to action and they rubbed their legs together like a soft horn section, and when it heard Pete singing, it shifted the very ground beneath Bicho Raro so that the sand and the dirt pounded a beat that matched the sound of the incomplete heart that lived in Pete Wyatt. I was dead the moment Pete Wyatt fell in love with the desert and the desert itself raised its head and took note. But Beatriz and Pete dancing as Pete softly sings Patsy Cline? And every other marvelous and magical character pausing to mark the beauty of the moment? That put the nail in the coffin. I am truly dead. I am dead of all the crooked, light-filled things.